Beauty and Barber services are provided by a licensed cosmetologist each week. Our salon is also available for our residents to invite their own stylists. Stop by our Coffee Shop to grab a quick cup of joe on your way to one of our activities or linger in our comfortable seating area to catch up with news from other residents, staff and family. 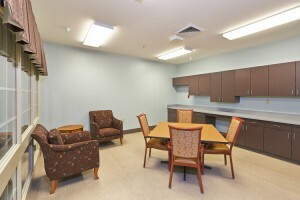 Resident Council meetings occur monthly in our facility. Our local Ombudsman has played an active role in assisting to educate how important this group is, in the facility. This is a key to ensuring that everyone we serve has a voice. Clear Creek Nursing and Rehabilitation Center has wonderful church volunteers who provide religious services throughout the month. All religious preferences are welcomed and recognized.